St. Petersburg Country Club boasts 11 Har-Tru Courts, 6 of which are lighted for night play! ur Tennis professionals are happy to play with you, arrange a match, and help organize monthly socials as well as competitive leagues. We offer a full service pro shop complete with racket stringing services! There is something for everyone in the family who enjoys tennis to thrive in here at SPCC’s Tennis Center! In recognition of his 27 years of outstanding service to the club, the SPCC Board of Governors recently voted unanimously to rename the tennis facility in Sam’s honor. 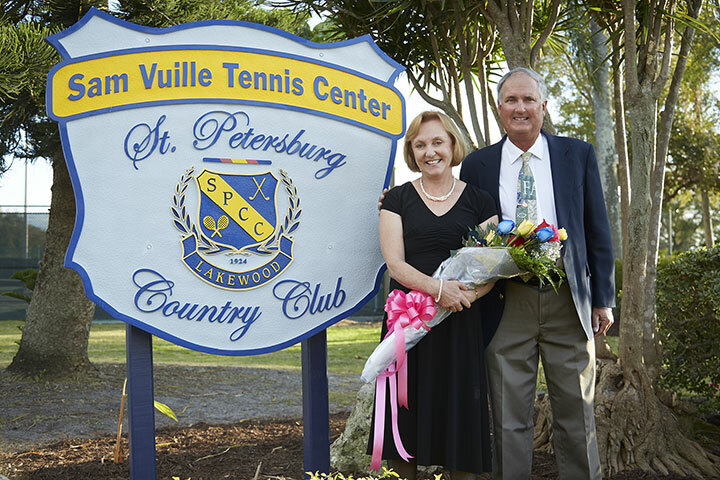 Henceforth it will be known as the “SAM VUILLE TENNIS CENTER at the St. Petersburg Country Club”. Sam’s background includes several Florida State Championships as a junior. He was one of only two players in Florida history to hold the #1 ranking in all four junior age divisions. Sam went on to the University of Alabama where he led the Crimson Tide to its first SEC Championship. On the professional circuit, he competed at both Wimbledon and the U.S. Open. In 2007, Sam was inducted into the Florida Tennis Hall of Fame. Sam now spends countless hours teaching tennis to men, women and children of all ages and skill levels. He has also worked tirelessly for 11 years as the Tournament Director of the Raymond James SSGP, one of the premier events among the USTA National Category II tournaments. Best wishes to Sam for many more years of great tennis!